Transformer size or capacity is most often expressed in kVA. “We require 30 kVA of power for this system” is one example, or “The facility has a 480 VAC feed rated for 112.5 kVA”. However, reliance upon only kVA rating can result insafety and performance problems when sizing transformers to feed modern electronic equipment. Single phase electronic loads can cause excessive transformer heating. Electronic loads draw non-linear currents, resulting in low voltage and output voltage distortion. Oversizing for impedance and thermal performance can result in a transformer with a significantly larger footprint. It is vital for the systems designer to understand all of the factors that affect transformer effectiveness and performance. Historically, transformers have been developed to supply 60 Hz, linear loads such as lights, motors, and heaters. Electronic loads were a small part of the total connected load. A system designer could be assured that if transformer voltage and current ratings were not exceeded, the transformer would not overheat, and would perform as expected. A standard transformer is designed and specified with three main parameters: kVA Rating, Impedance, and Temperature Rise. The transformer voltage and current specification. KVA is simply the load voltage times the load current. A single phase transformer rated for 120 VAC and 20 Amperes would be rated for 120 x 20 = 2400 VA, or 2.4 KVA (thousand VA). Transformer Impedance and Voltage Regulation are closely related: a measure of the transformer voltage drop when supplying full load current. A transformer with a nominal output voltage of 120 VAC and a Voltage Regulation of 5% has an output voltage of 120 VAC at no-load and (120 VAC – 5%) at full load – the transformer output voltage will be 114 VAC at full load. Impedance is related to the transformer thermal performance because any voltage drop in the transformer is converted to heat in the windings. Steel selection, winding capacity, impedance, leakage current, overall steel and winding design contribute to total transformer heat loss. The transformer heat loss causes the transformer temperature to rise. Manufacturers design the transformer cooling, and select materials, to accommodate this temperature rise. Use of less expensive material with a lower temperature rating will require the manufacturer to design the transformer for higher airflow and cooling, often resulting in a larger transformer. Use of higher quality materials with a higher temperature rating permits a more compact transformer design. In the 1980′s, power quality engineers began encountering a new phenomenon: non-linear loads, such as computers and peripherals, began to exceed linear loads on some distribution panels. This resulted in large harmonic currents being drawn, causing excessive transformer heating due to eddy-current losses, skin effect, and core flux density increases. Standard transformers, not designed for nonlinear harmonic currents were overheating and failing even though RMS currents were well within transformer ratings. “K” factor is a good way to assure that transformers will not overheat and fail. However, “K” factor is primarily concerned with thermal issues. Selection of a “K” factor transformer may result in power quality improvement, but this depends upon manufacturer and design. Transformer impedance is the best measure of the transformer’s ability to supply an electronic load with optimum power quality. Many power problems do not come from the utility but are internally generated from the current requirements of other loads. While a “K” factor transformer can feed these loads and not overheat, a low impedance transformer will provide the best quality power. As an example, consider a 5% impedance transformer. When an electronic load with a 200% inrush current is turned on, a voltage sag of 10% will result. A low impedance transformer (1%) would provide only a 2% voltage sag – a substantial improvement. Transformer impedance may be specified as a percentage, or alternately, in Ohms (Ω) from Phase- Phase or Phase-Neutral. Most transformer impedance discussions involve the 60 Hz transformer impedance. This is the power frequency, and is the main concern for voltage drops, fault calculations, and power delivery. However, nonlinear loads draw current at higher harmonics. Voltage drops occur at both 60 Hz and higher frequencies. It is common to model transformer impedance as a resistor, often expressed in ohms. In fact, a transformer behaves more like a series resistor and inductor. The voltage drop of the resistive portion is independent of frequency, the voltage drop of the inductor is frequency dependent. Standard Transformer impedances rise rapidly with frequency. However, devices designed specifically for use with nonlinear loads use special winding and steel lamination designs to minimize impedance at both 60 Hz and higher frequencies. As a result, the output voltage of such designs is far better quality than for standard transformers. System design engineers who must specify and apply transformers have several options when selecting transformers. Selecting and using “K”-factor rated transformers is a prudent way to ensure that transformer overheating will not occur. Unfortunately, lack of standardization makes the “K” factor rating a measure only of thermal performance, not impedance or power quality. Some manufacturers achieve a good “K” factor using design techniques that lower impedance and enhance power quality, others simply derate components and temperature ratings. Only experience with a particular transformer manufacturer can determine if a “K” factor transformer addresses both thermal and power quality concerns. Transformers designed specifically for non-linear loads incorporate substantial design improvements that address both thermal and power quality concerns. Such devices are low impedance, compact, and have better high frequency performance than standard or “K” factor designs. 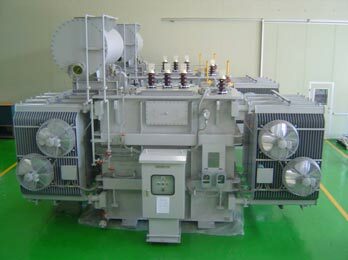 As a result, this type of transformer is the optimum design solution. This type of transformer may be more expensive than standard transformers, due to higher amounts of iron and copper, higher quality materials, and more expensive winding and stacking techniques. However, the benefits of such a design in power quality and smaller size justify the extra cost, and make the low impedance transformer the most cost effective design overall.